We’ve been a little behind on our reading so it was just in the past couple of days that we read the Sports Illustrated article about how San Francisco’s Alex Smith has turned into a viable NFL quarterback – at least through the early part of the season. In the article (written after the 49ers win over Detroit), Jim Trotter points out how a simpler game plan calls for Smith to do less, which means he doesn’t have to force things or take as many chances. “With this coaching staff and this system, the way it’s built, it’s just take the plays that are there,” Smith said in the article. The seventh-year quarterback is also helped by his offensive line, where three of the five starters are first-round picks, and a running game that is sixth-best in the league after averaging 188.5 yards per game in October. 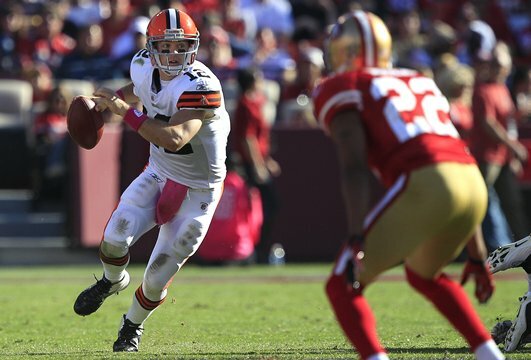 Reading that got us thinking again about The Colt McCoy Question, mainly wondering if the Browns will know when to cut ties with McCoy, if that day ever comes around. Solid offensive line? Strong running game? Simpler offensive plays? Sounds like a blueprint the Browns would consider following to help develop McCoy. Of course, a season-ending injury to guard Eric Steinbach forced rookie Jason Pinkston into the lineup perhaps before he was ready. And right tackle Tony Pashos’ play has reminded fans of John St. Clair. Same with the running game. Injuries have stalled Peyton Hillis and Montario Hardesty, meaning the Browns may very well line up with Chris Ogbonnaya and Thomas Clayton as their running backs on Sunday in Houston. Those injuries have conspired against the Browns and contributed to McCoy not making as much progress this year as many had hoped for. And let’s not forget the wide receiver play. It’s still possible, of course, that even if the Browns surround McCoy with talent that he won’t be the answer, but now is not the time to make that call. The Browns have been searching for a quarterback since trading away Bernie Kosar. They’ve tried young quarterbacks, veteran quarterbacks, benching quarterbacks after a couple of games only to make them the starter again later in the season, and none of it has worked out. While we don’t expect – or want – the Browns to take seven years to make a determination on McCoy (but really, after 47 years without a title what’s another five years? ), Smith offers another good lesson about not making hasty decisions over the quarterback position. Because he works for a morning newspaper and we write for the Internet equivalent of the evening edition, Terry Pluto made the same points in today’s paper. Of course, not everyone shares our same opinion, but that’s what makes sports in this town such a spicy topic.